To say it has been quite a week (less a few months since we started this) is an understatement. What began as a few entrepreneurs completely frustrated over the availability of capital to fund ‘our American dreams’ has turned into a full fledged Bill (HR 2930) before Congress with the President’s support hailing us as the ‘nation’s economic engine and job creators.’ How amazing that both sides are eager to move this forward to help create JOBS! We would love to have you continue to contribute to this initiative and will provide some opportunities at the end of this email. We thought we were on to something, but all this? Seriously!??? So as the e xpression goes, when it rains it pours. 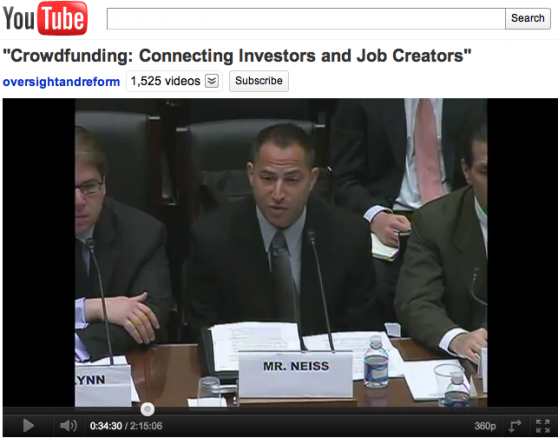 This week other than having our own hearing on Capitol Hill called “Crowdfunding – Connecting Investors and Job Creators” we were profiled on the Dylan Ratigan Show on MSNBC and our efforts were documented in numerous media across the board. Needless to say, we owe a debt of gratitude to Karen Kerrigan of the Small Business and Entrepreneurship Council for rallying behind us as well as all the media that covered this issue. We would love to continue to spread our message about how this idea … ne law … can get a limited amount of capital flowing to our nation’s job creators with the backing and support of the community where the crowd will take over as the vetting ground for these seed rounds. Yes the naysayers are out there. We welcome them. If you think about it, they are just proving our theory. If the majority of people believe the naysayers and don’t believe in what we are advocating then we won’t be successful in changing the law. If they do, they will back us with their support much in the same way that successfully funded ideas on these future Crowdfund Investing (CFI) platforms will receive not only money but experience, knowledge, wisdom, and the marketing power of their backers. We’ve been tasked with a couple follow up items, which we encourage you to contribute. First, we need more stories of entrepreneurs who have used crowdfunding to help fund their businesses and second, we need to further address how we can mitigate fraud and increase investor protection under our model. To this end, we’ve started a dialog on our website were people can contribute ideas that will increase transparency and accountability and hence reduce fraud on CFI platforms. Any other ideas you have would be welcome. Please email them to us. We will review them and attach the best to the legislation before Congress. If you are part of the media, we would love to continue the discussion with you. There are only a handful of ideas emanating from the Jobs Act that have the bipartisan degree of support that Crowdfunding has, so we believe that we have a unique opportunity to drive this across the finish line because this initiative is all about creating jobs and innovation. Check out the links below. It is a great way to see our progress from last week. Also, please use these materials when you are speaking with friends, colleagues, elected officials and the media. Every conversation, online or offline, is important to making The Startup Exemption a reality! O’Reilly Radar: Crowdfunding Gets Traction in D.C.